My dad is almost 92 years old. His health is only now beginning to go seriously downhill. For as long as I can remember, he walked every day, usually several miles. Until very recently, my dad, who’s just a little guy, was so strong that much larger men feared his bone-crushing handshake. He drank a glass of red wine every evening at dinner. Just one. He never smoked. He has outlived seven of his eight siblings, as well as his oldest son. Because of his healthy and active lifestyle, he remained strong and robust well into his golden years. He’s been an inspiration to everyone who knows him. But, as the old cliche goes, all things must come to an end. I guess it was probably a slow and steady decline, starting when my brother passed away nearly six years ago. My dad just sort of began to shut down. He feels guilty for being so old when his son died so young. As any parent who loses a child, I think he wished more than anything that he could change places with him, that his son be the one to bury him and then be the one to grow old. Woah, that’s heavy, isn’t it? What does all this have to do with downsizing and tiny living? Well, it’s something that occurred to me this past weekend when I was visiting my parents. My sister and I wanted to help them clear out some of the clutter in their little apartment so that Dad could make his way easily throughout the place with his newly acquired walker. We arrived at the folks’ apartment armed with two strong men (my nephew and brother-in-law), a truck, and the best of intentions. But the folks dug in their heels. They weren’t having it. No sir! Move their stuff? Whaaaaaat?? Where would it go? What were we going to do with the stuff that was inside the stuff?? They were both so rattled by the thought of us taking any of their stuff away. So, we abandoned the idea, assured them that they would not have to part with anything they didn’t want to part with, and we all went on to have a nice quiet visit. We left them with the task of thinking about what they wouldn’t mind parting with, and a plan to come back the following week and help them re-organize their apartment to improve the flow and accessibility. This seemed to be an acceptable compromise. But as we sat and talked about ways to let go of unnecessary clutter, I took mental stock of my surroundings. Their little apartment is just crammed full of stuff. There are stools with plants on them taking up every empty bit of floor space available. There are stacks of paper on every surface. There is far too much furniture for the size of the apartment. But every piece has a story, and a reason that it can’t possibly be parted with. My parents downsized several years ago from a large house on an acreage in the country to a small, two-bedroom apartment in a 55+ building within easy walking distance to all conveniences: a supermarket, liquor store, doctors’ offices, Tim Hortons, a yarn shop. It was a well-timed move for them. They were still active, mobile and healthy. And they were ready to get rid of a lot of stuff to fit their lives into a much smaller place. They loved the location and the carefreeness of apartment living. It’s a pretty little apartment with a balcony where they can grow flowers and tomatoes and sit outside in the shade on a sunny day. When they decided to make this move, they had a big yard sale and got rid of what seemed like a whole lot of stuff. A lot of what they couldn’t sell, they donated. The rest came with them. Even though they had managed to lighten their load considerably, they still had an awful lot of stuff. And all that stuff got crammed into the new apartment. Bookcases overflowing with books and knick-knacks. Chests full of stuff. Cabinets full of stuff. Desks full of stuff. A storage room full of stuff. A wall to wall, floor to ceiling custom-built china cabinet FULL. OF. STUFF. To complicate matters, most of the chests, bookcases, stools, and the china cabinet were all hand-made by my dad. Most of these pieces were meticulously hand painted by my mom, who specialized in Swiss-style tole painting. This, of course, makes letting go of any of these pieces absolutely out of the question. They have an emotional attachment to all their stuff. Even the useless stuff. My mom has boxes full of greeting cards and letters she’s received from people over her entire lifetime. She’s 83 years old. That’s a lot of paper! They have gifts given to them by dear friends over the years – gifts they never even liked. But they can’t let them go because it would feel like dishonouring the loved ones who’d given the gifts. During our afternoon visit, we talked about the possibility of letting a few things go. My sister and I are gentle, non-aggressive people who hate the thought of forcing old people to let go of things that are dear to them. We’re the biggest softies. So the conversation was loving and supportive. But we left them with some food for thought. Things like: just because you love the giver, it doesn’t mean you have to love the gift, and if you don’t love the gift, pay it forward. You’re clearing up your home of clutter. That doesn’t lessen the way you feel about the people who’ve given you gifts. It doesn’t dishonour them. You’re simply paying it forward so that it can give joy to someone else. This way of thinking seemed to work for my mom. It certainly worked for me when my husband and I downsized. I have also been known to get emotionally attached to stuff, so I understand how my parents feel. My sister and I exchanged a quick and subtle “are you freakin’ kidding me” look. But it’s a start. And that’s going to have to do for now. So this all got me thinking: is it possible that, in some cases, elderly people become more attached to their stuff as they near the end of their life? Do their material possessions become a sort of life line? Maybe being surrounded by the things that have been with them for so many years simply gives them comfort. They’re surrounded by memories of lives well lived. If they let go of those things, maybe they’re afraid they’ll lose the memories. Alzheimer’s is a constant fear for the elderly people in my life. It’s a terrifying time for my folks, there’s no denying that. I see the fear in my mom’s eyes, fear of being left alone if my dad checks out before she does. My husband’s parents are going through it too. So, if stuff gives them comfort at such a difficult time of life, then why shouldn’t they hang onto it if they can? I think the thing to remember is just to be mindful of how terrifying this time of life is for my parents. And to be compassionate, loving and supportive, despite how frustrating the clutter can be. It’s not about the stuff, after all. It’s about making their golden years as comfortable as possible, making their life as easy as possible, filling the time they have left here with us with as much joy as possible﻿. They need to know that we’ll find a way to make it all work, that we’re there for them, and that it’s all going to be ok. 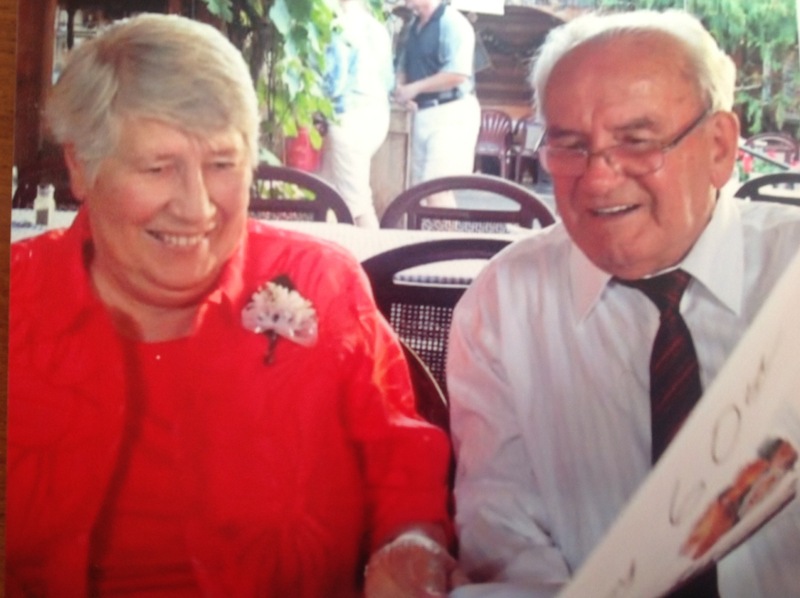 This is a photo of my folks at their 60th wedding anniversary celebration. I can totally relate to your situation. You are correct to say that an emotional attachment is there. My parents would not part with anything. I can’t sugar coat it. It was hoarding. To make a long story short It has taught myself and my siblings the importance of getting rid of unnecessary things in order to maintain quality of life. Nothing worse than feeling like you are being forced out of your living space due to overwhelming clutter. I’m forever on high alert keeping watch on what is happening in our home to ensure I will never experience that again. Give away, donate, and free your space of clutter. I recently had a bit of an epiphany moment when a shelf in a kitchen cupboard collapsed. I had a lot of my vases in it along with some odd bits of China and serving bowls. Among the shattered carnage on the floor following the crash, were the bits and pieces of a rustic glass vase I had bought as a gift for my dad when I visited the Venetian island of Murano as a kid. I had reclaimed the vase after he died and have treasured it since. Obviously this item packs quite the emotional wallop. Surprisingly, once I got past the initial cursing and teary demonstrativeness, I was able to remind myself that it was only stuff. Stuff can be replaced, if necessary, but the memories can’t and I still have those. I do wish I still had it but I’m not crushed by it’s loss. Thanks so much for your engaging posts! I can relate to the gift thing. As I purge, i really stumble when I hold a gift in my hand. I’m thinking about the giver and feeling guilty and sad! And also things the kids made when they were little. Any thoughts or advice on this? This is a tough one, isn’t it? I have difficulty with it too. I’ve found that I can bear parting with things that were gifts by holding the item close (hugging it, crazy as that may sound! ), think of the giver with gratitude and love (this really helps with the guilt and sadness thing), and then just pay the item forward so that someone new can enjoy it. Another thing you can do is take a picture of the item before you pay it forward, so you preserve the memory of the gift without the clutter. I’m not a parent myself, but I’m an auntie and step-mom, so I also have had gifts that kids have made and they are difficult to let go of. If you can’t let them go, don’t. If they spark joy (I borrowed that term from the brilliant Marie Kondo), keep them. But to cut down on clutter, maybe you want to just pick the best ones and let the others go. Take photos of them before letting them go into the recycle bin, if that makes it easier. Thanks for reading and for sharing your thoughts!